Bowen Designs recently released a sculpture of Goliath by Randy Bowen. I ordered one for myself and it arrived last week. I thought I’d take a few pictures of it and share them with you. There is a bit of a back story to this statue. Unfortunately I’m not entirely clear on it. I believe Randy Bowen had originally created this sculpture around 2000 or so and pitched it to Disney. Disney passed and the few prototypes he’d made collected dust. At least one found its way onto eBay and I got to see it in person (and unpainted) at, I believe, the 2004 Gathering. 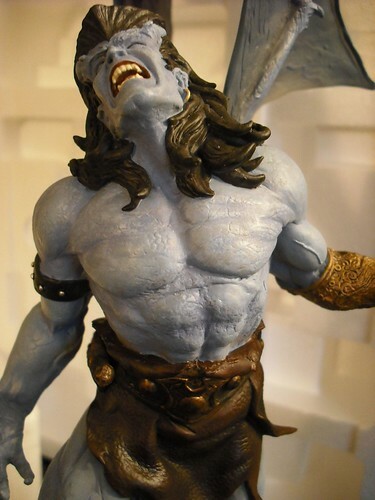 I believe Bowen later tried to market the sculpture as simply “Randy Bowen’s Gargoyle”, but Disney stuck their lawyers on him before he could produce it. For whatever reason Disney and Bowen recently (within the last year) came to terms and Bowen Designs was finally able to produce the sculpture. The sculpture has a limited run of 750. Mine is #67. And I’m glad I bought it.